It’s only been 15 minutes and I’ve already been sick in my mouth and had a near-ish miss with a right-turning car crossing the road ahead of me. The exposed parts of my newly shaved thighs have turned lobster pink and I can feel a horrible sludgy build-up of spit and sweat forming at each corner of my mouth as it is dried in the rushing wind.. They say that the first fifteen minutes in an Hour are “free”; that the effort doesn’t really begin until after that. Yeah, right. In fact nothing is ‘free’ in “An Hour” (I don’t really feel justified in using the definitive article for my efforts). From the moment you decide to do it the bills start clocking up. Initially the notes in the theoretical ledger’s minus column are limited to just draining you of your spare-time, but this very soon extends to actual money and a dash of self-respect. At the same time the plus column in the ledger is starting to record the credits of pain and anxiety. By the time I got to my start line a few hours ahead of Bradley Wiggins got to his last Sunday I already felt that I had paid five or six times over. One short test run around Blackheath made me think otherwise. Hitting more than 35.4kmph is one (reasonably difficult) thing but keeping the pace above this mark is another (fiendishly difficult) thing entirely. Even in the wide open spaces around the Heath, high winds, tight corners, traffic lights and cars all soon conspire to slow you down. And that’s before you even get the chance to start worrying about holding the pace for an hour. This was not going to be quite as straightforward as I thought.. The only thing that was easy was deciding on a date. Very early on I decided that I would go when Brad went. 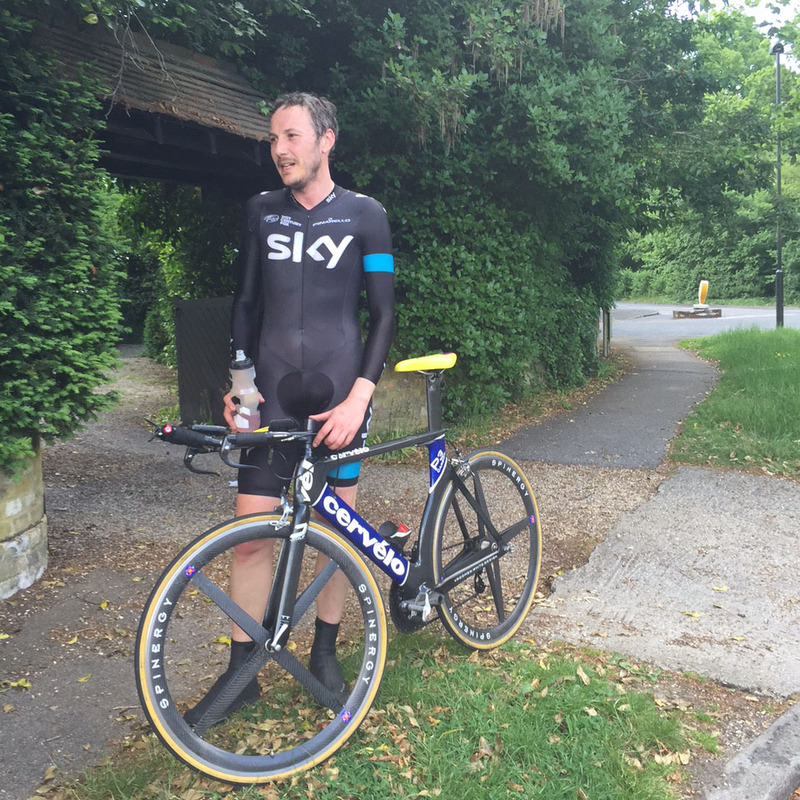 Jack had opened the challenge before Sir Wiggo had made a formal announcement but we all knew it would be a month or so after Paris-Roubaix so it felt like I had a lot of time to work out a plan and to do some actual training. By the time Brad had confirmed it would be Lee Valley on the 7th June I had borrowed some clip-on aero bars from my brother and was using them to get used to a basic TT position. My test run had told me that my local roads were no good but had also convinced me that I was going to need every marginal gain I could muster to beat Henri. So, as well as spending time on the turbo trainer in the garage trying to hold a set wattage for (tear-inducingly short) periods of time, I set about the business of begging, borrowing or stealing the best equipment I could lay my hands on. A few people had made short work of Jack’s challenge by knocking off something in the 40’s around a track but I felt that I needed to try and do it on open roads.My thinking was that this sort of evened the playing field between myself and Desgrange. 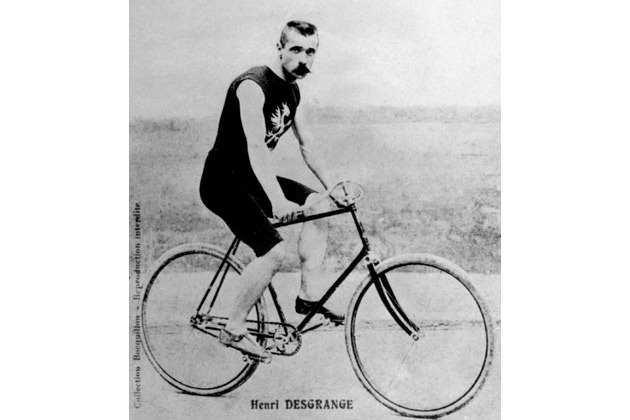 He had had youth and an unobstructed track on his side; I would have a bike that didn’t weigh as much as a farming implement and a smattering of modern aero tech.. It’s also entirely possible that Desgrange had some of the usual ‘pick-me-ups’ that riders of his era favoured whilst I would merely have to make do with a super-caffeinated energy drink.. Approaching half an hour done and I start thinking about how nice a puncture would be. It would be the only face-saving way out of what now lies ahead.. The 5km North-South route just outside of Chislehurst is proving fast enough. It’s tree-lined either side for most of the route, sheltering me from most of the wind. It’s flattish, with a gentle downhill being offset by the same in reverse on the return leg. Traffic is light and the roundabout at the southern end can be taken without losing too much momentum. The issues are the mini-roundabout that needs to be negotiated at the mid-point (straight across but slowing in case of traffic from the left) and the northern turn. My plan to use another nearby roundabout has been blown by the presence of unremembered speed bumps leading to and from it, so I’m having to U-turn in the A208. I have a bit of run-off road to play with so that I can try and choose my moment but it’s still pretty much a dead stop every 8 minutes.. The hours in the garage (of which there were decidedly fewer than there could have been) were the worst. Turbo-training is purgatory at the best of times and these were decidedly not the best of times. Stripped of any of the aero benefits that I might enjoy when in actual motion I was just left with horribly low numbers recorded in deflatingly short spells. Every time I would contemplate the growing pool of sweat below me and ask myself why the hell I was doing this.. The answer may have been at the bottom of one of those pools but I never got close to finding it. The aero bars on the road bike were at least proving to be of use. From wobbling like a new-born fawn when first using them, I was by now able to use them with a good degree of confidence and was able to resist the urge to abandon them when confronted by the slightest lump, turn or narrowing of the way ahead. I’d also got my back more used to the lower position and could hold it with relative ease. As long as I didn’t breathe too much or need to look upwards to see where I was going. Great! 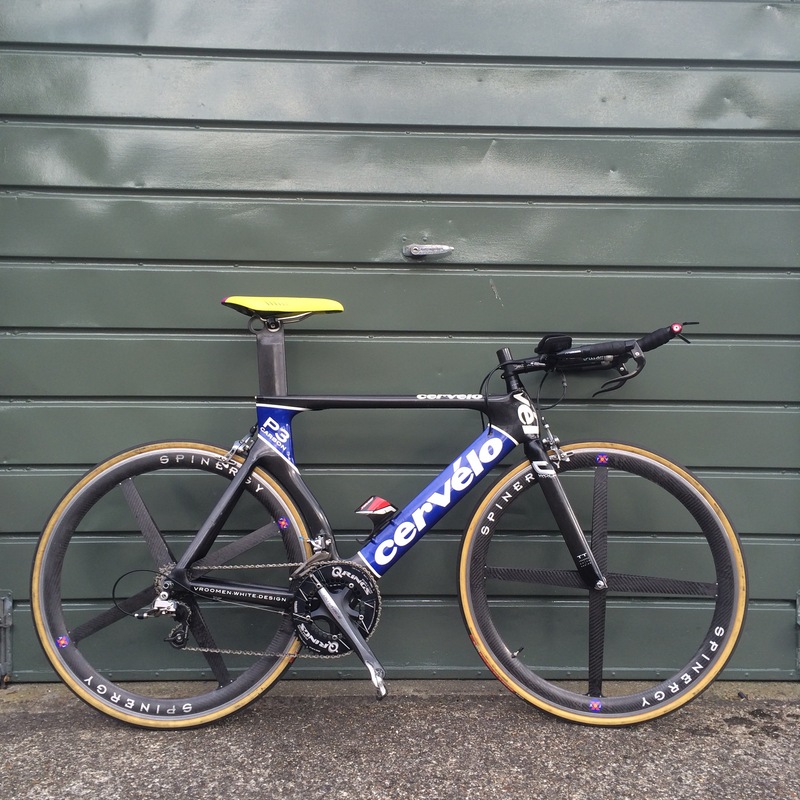 The first moment that I thought I could do it was when Olly Stevens at The VeloHouse down in Tunbridge Wells said he would lend me his Cervelo P3 TT bike. Olly is a bike connoisseur so I knew that whatever it was it wouldn’t be too shabby. He described it as ‘old’ but it’s still newer than anything in my collection and lighter than anything I will probably ever own. Full carbon right down to the gear shifters with Dura-Ace, Q-Rings and old school Spinergy wheels, which Olly actually apologised for and said that he would swap for some ‘fast Eastons’ before ride day.. To my mind it looked fast even when it was standing still – which is just as well as that is all it did for the next couple of weeks as I was far too afraid to take it out anywhere. I did take my road bike out and tried to do a full hour test at the outdoor road track at the Olympic Park. It was going pretty well until 40mins in when the folly of doing such a test after a full day at work, without eating since lunchtime, hit me hard. I dragged myself around the increasing hilly track for another twenty minutes on willpower alone and then crawled to the vending machine in the foyer and pushed buttons like a ravenous zombie. Even from my half-dead state I could see what a sorry sight I was presenting to the people working on reception. Chalk a bit more self-dignity into the minus column please. Not doing it today had been at the forefront of my mind Sunday morning. I’d woken with the slightest of dry throats and a tiny touch of hay fever and had pretty much postponed the event in my mind before even getting out of bed. You know how some people really thrive on pressure? Well, I am not one of those people and I was looking for a way out before I had got started. It took a couple of hours (and one last god awful warm-up session in the garage) to convince me to get the hell out of the house and go do this thing. All I had to do was shave down, suit up and go. The aero-suit had arrived from Rapha two days earlier. They had kindly said that they would send something a while earlier but it had come with a lot of caveats, so I had opened the package with some trepidation. I had been warned that it was a prototype and was likely to split apart during use but, even if it did hold together, that the material was pretty ‘sheer’ and that my arse would be visible through it.. It sounded as though the dignity column in the ledger was about to take a few more massive hits. 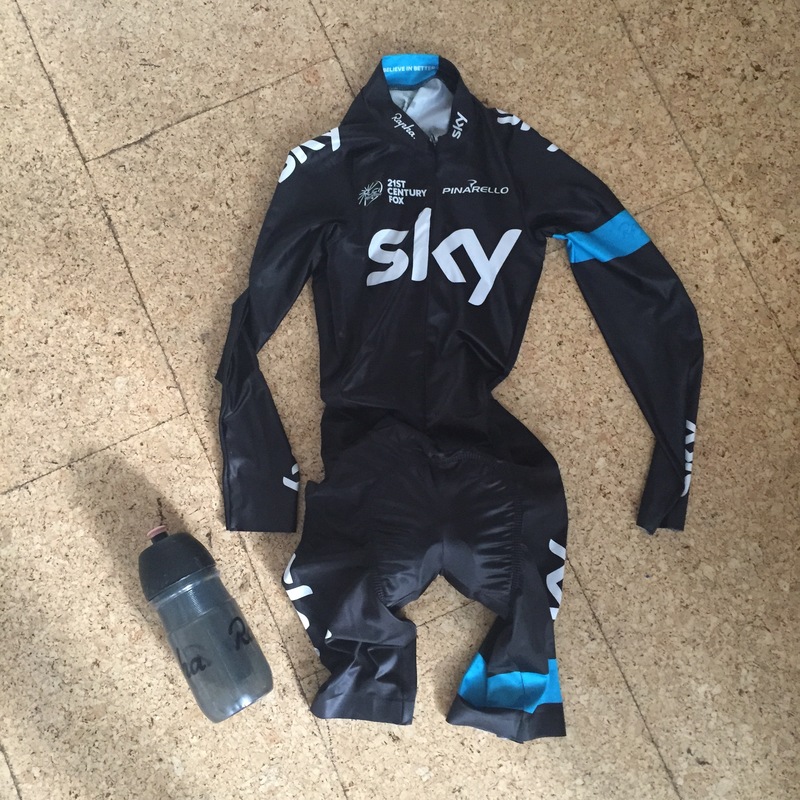 In the end they (wonderfully) just sent a Sky Pro Team aero-suit instead. The only problem was that it looked about 5 sizes too small. It took me a full 15 minutes, and a huge amount of bodily contortions, to get it on the first time – I still thought it was the flimsy prototype and was being extremely tentative with it. It turns out that this level of difficulty pretty much means that it is exactly the right size. Combined with a second–hand aero helmet from my online cycle forum and my rainy day overshoes, I was finally ready to go. 45 minutes gone and, for the first time, my confidence starts to increase. My strength is ebbing and my average speed slowly begins to fall but I think that I’ve got enough in hand to manage the effort. I’ve had my moments of frustration with queues of traffic at the mini-roundabout and with a very persistent bus behind me when I wanted to do my northern turn but I’m still at 37.1kmph average when I get to the end of the most recent uphill section. I have had the ‘luxury’ of carrying water and an energy gel – something that Brad and the other trackies aren’t allowed – which I’ve taken on board coming out of the slow turns. The water especially has been a help. It’s a hot day and I would have wilted without it. Knowing now that I can do this if I just keep going I settle into the last push for the line. As I cycled down to Chislehurst to warm up I realised that, apart from a 5 minute wobbly run up and down our street on the day I got the Cervelo, I haven’t actually ridden it outside of the garage. My panic at this fairly momentous oversight was instantly tempered by realising how bloody fast the thing is. The lightest of pushes on the pedals seemed to throw the bike yards forward and the unusually muted noise of the air being cut through was music to my ears. The ride to Chislehurst was a great boost and the day couldn’t really have been better, with low wind and warm sun. Save for the high air-pressure (I think I’m right in saying that both Brad and I cycled through air at least as thick as jelly for our attempts…) putting it off even a day would have been stupid. Though not as stupid as deciding to do the thing in the first place of course..
My partner Rachel and eldest son Milo came along to cheer me on – though Milo seemed to limit his cheering to raising an eyebrow from whatever he was reading once or twice as I came past their vantage point – and that definitely helped as well. Although I couldn’t hear anything (sadly this is because the aero helmet was covering my ears rather than the fact I was going faster than the speed of sound) seeing them gave me a boost each time and knowing I didn’t have to cycle home afterwards helped me empty the tank in the final ten. Of course the last ten minutes were the worst. Even though I knew I would beat Henri Desgrange’s mark, they were still insufferably awful. The last two ‘ascents’ (and the gentle inclines really felt like ascents now) saw my speed drop alarmingly and I had to resort to shouting at myself to keep myself going at anything like the rate I should have been. I’d been trying to work out where on the course would be best to finish and had attempted to engineer the close of the hour to coincide with the end of the downhill section when my average was highest but my slump on the slopes cocked it up and I ended up finishing half way back the slope again, shaving a couple of precious tenths off my average. Strava decided to steal another when I uploaded later. It’s a bloody good job I beat Henri by 1.5km because I would have looked pretty daft if I thought I had beat him by a tiny amount and then Strava had rounded me down below him again..
As soon as it was over the protection that ‘doing something’ gives you over looking foolish whilst you are doing it ebbed away and I realised that I already looked pretty daft; standing outside someone’s suburban front garden in an pro-team aero-suit, panting like a dog. You may have not been able to see my arse through this one but I was most definitely breathing out of it by the time I finished and I cut a pretty sorry state I’m sure. 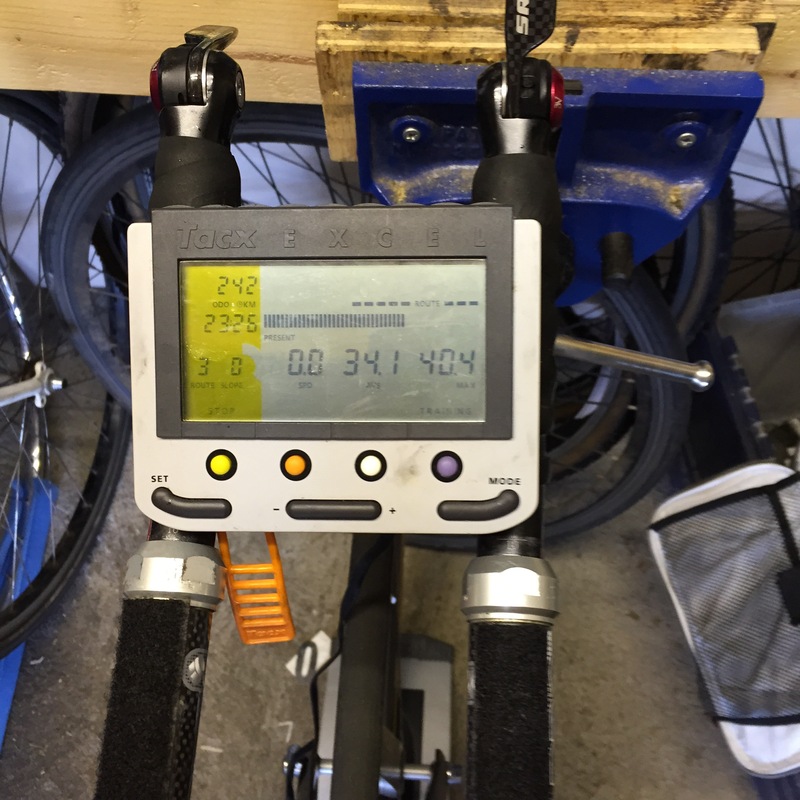 I also realised that I should have rigged up some tanning lights in the garage to switch on during the turbo-training sessions. I have hardly been outside on any bike since deciding to take this on and the alabaster colour of my legs are testament to that. At the end of the day… (at the end of the Hour I should say..) I achieved what I set out to do and I felt very pleased with that. By the end of the day Wiggins had done the same and by almost exactly the same margin too. And you know the best bit of all? I never have to do it again.. Thanks to Jack Thurston & Henri Desgrange for the inspiration; Olly Stevens at The VeloHouse & James Fairbanks at Rapha for the kit; Rachel & Milo for the cheering & the ride home; and the good people of Chislehurst for not running me over when I was going a little bit faster than I maybe should have been. Also to Brad, for not putting the record on the shelf and keeping interest in it high. This entry was posted in Ride Reports and tagged Bradley Wiggins, Cycling, henri desgrange, hour record, strava. Bookmark the permalink. Fantastic effort and story. Had dreams myself of such a feat, but in a velodrome. Extra kudos for outdoors. And few more for getting into the skin suit! Thanks Human Cyclist. I’d like to try the velodrome but not for the Hour – I think that the boredom of going round and round (plus the lack of water) would make it really, really hard. I did a taster at the Olympic track recently, surprisingly thrilling but then I also happily take on laps of Regents Park for hours on end. After a while you soon enter a trance! So, clip on bars. I’ve been considering these for a while for some tempo work. Will you continue to use them or is it back to the hoods now? Definitely back on the hoods. Though first day without them I instinctively reached for them when I was on a long straight. Nearly hit the deck… I would recommend them as good training for the position and getting used to leaving the brakes alone. Brilliant, had me giggling all the way through, and WELL DONE!